This classic article from a leading scholar on nonprofit governance has, over the past few years, transformed much of the conversation about where the substantive governance of your nonprofit really resides—quite far from the boardroom. Be prepared to reconsider many of your assumptions about nonprofit boards of directors. As David O. Renz posited more than a dozen years ago, boards are merely one structure of a larger governance system, and you ignore that at great risk to your cause and your organization. This article is one of a cluster of updates on the concept of networked governance. Editors’ Note: We are very glad to introduce this special supplement on higher education opportunities in the area of nonprofit studies. In addition to this buyers’ guide-type article is a set of guidelines to help you judge curricula and a listing of programs. Many thanks to David Renz of the Midwest Center for Nonprofit Leadership for his help in putting this package together. Editors’ note: This article is adapted from its originally published version in the winter 2007 issue of NPQ. It highlights shifts in nonprofit governance models, authority, and decsion making that continue to apply today. 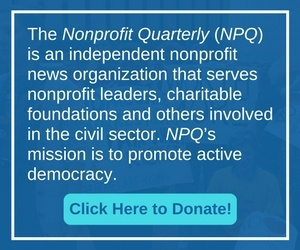 The Nonprofit Quarterly’s Study on (U.S.) Nonprofit and Philanthropic Infrastructure maps and examines the strengths and weaknesses of the network that supports nonprofits and philanthropy in the U.S. The study’s major findings have to do with who is getting best served among nonprofits and why but there is more here like lists of funders of the U.S. infrastructure and a very provocative sub-study of the financial models of infrastructure organizations. The Nonprofit Quarterly’s maps of the U.S. nonprofit infrastructure provide a snapshot circa October 2008 of the dynamic and complex community of organizations and initiatives that comprise the national infrastructure of the U.S. nonprofit sector. Exploring the Puzzle of Board Design: What’s Your Type? Many boards are just a set of accumulated practices that don’t necessarily follow a governance design. This article is an exciting approach to what the primary design principles in nonprofit governance are, and how they should be considered in the development of boards.